The Cortez Retail Enhancement Association and KRTZ radio have organized a local "Shop Hop" - Your Passport to Savings - that began today. There are 18 businesses participating (including Cortez Quilt Company, of course!). This event runs November 29 through December 6 (Saturday to Saturday). Pick up your passport at CQC or any other participating business. If you visit and get your passport stamped at all 18 you'll receive $40 in Cortez Cash and be entered to win a bedroom or living room furniture set. There are others prizes as well for partially completing your passport. Participating Businesses . . .
Join the fun and support your local, independent retailers this week! Everything Christmas is on sale . . . 25% off fabric, kits, patterns, and finished samples. We have four of these kits left for only $82.50. This is a beautiful 45" x 48" wall hanging. Even if you don't finish it by this Christmas, you can start now and enjoy it for next year! Phone orders welcome. 970-565-7541. Wednesday, December 3, 5:15 – 6: 30 p.m.
Cindy Dahl recently spent a week at BERNINA headquarters in Chicago learning all about the amazing things that can be done using BERNINA software. 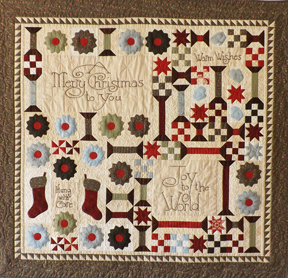 Join us on Wednesday, December 3 at 5:15 p.m.when she will give an overview of the software available from Bernina: Embroidery Software 7 Designer Plus, Embroidery Software 7 Editor Plus, DesignWorks Suite (CrystalWork, CutWork, PaintWork) and the free ArtLink software. She will provide demos, show samples, and discuss the benefits of each product. Make plans to attend if you already have embroidery software and want to see the newest version, if you’re considering investing in embroidery software, or if you’ve been thinking about upgrading to an embroidery machine. Please RSVP by calling 970-565-7541 or sending an e-mail to karen@cortezquiltcompany.com as we will be serving light refreshments. Sunday, December 7, 1-3 p.m.
Come meet Mary Kay representative Haley Leonard and see all of the amazing new Mary Kay skin care and makeup products for both women and men. Pick out wonderful holiday gifts for your friends and family, or create your wish list to send to your Santa! Enjoy refreshments and door prizes! Please RSVP to haley.leonard@marykay.com or 314-368-2723 or stop by and say hello. Wrapping and shipping will be available. FREE – First of three free holiday classes in December . . . our gift to you! Cindy Foote and Cindy Dahl will team up to teach this class where you can choose from several different options for turning simple tea towels into works of art. Sign up today! 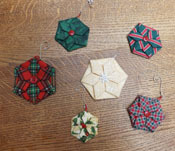 Beth Cardozo will teach Origami Christmas Ornaments for us again this year. Last year everyone has so much fun making these! No sewing machine needed. Bring holiday fabric, rotary cutter, scissors, needle & thread, scraps of batting if you have any, and buttons or other embellishments for center of ornaments. You will need a hexagon ruler (we’ll have them in stock if you don’t already own one). 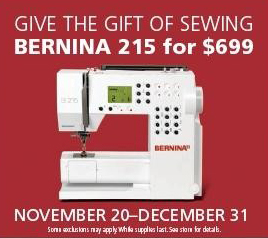 Ask us about 0% financing for SIXTY months on a new BERNINA ($3,000 minimum purchase). This offer is good through Wednesday, December 3. Get more information on financing here.